Here's my latest hat WIP. I'm not entirely sure I like how it is turning out. I might just frog the whole thing and start over. What do you think? 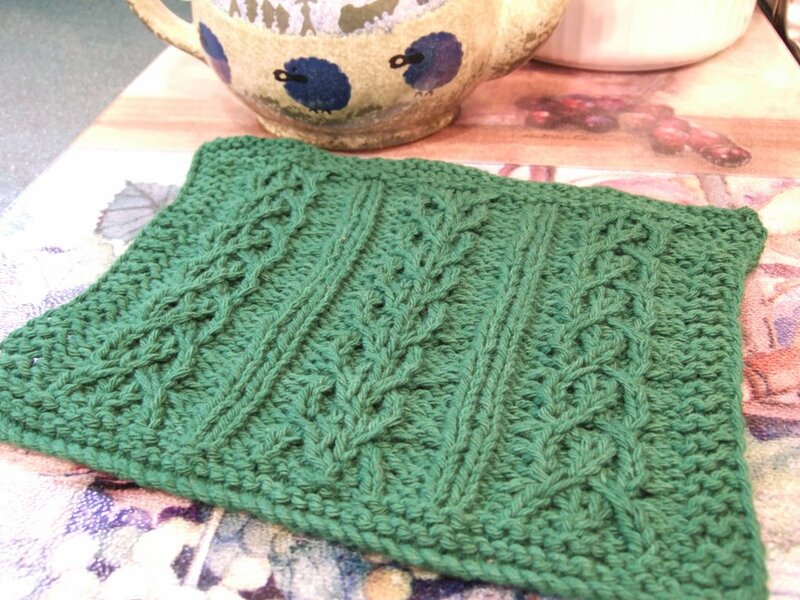 After working on the Claudia Hat, I really needed to do some mindless knitting. 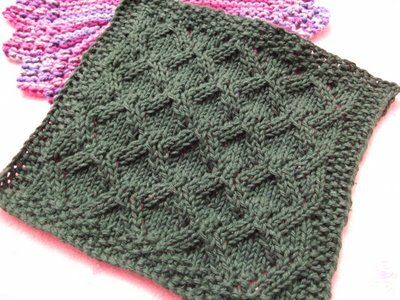 This pattern is so easy, with just simple knit & purl stitches, you can easily work on this without looking at the pattern or keeping track of which row you're on. 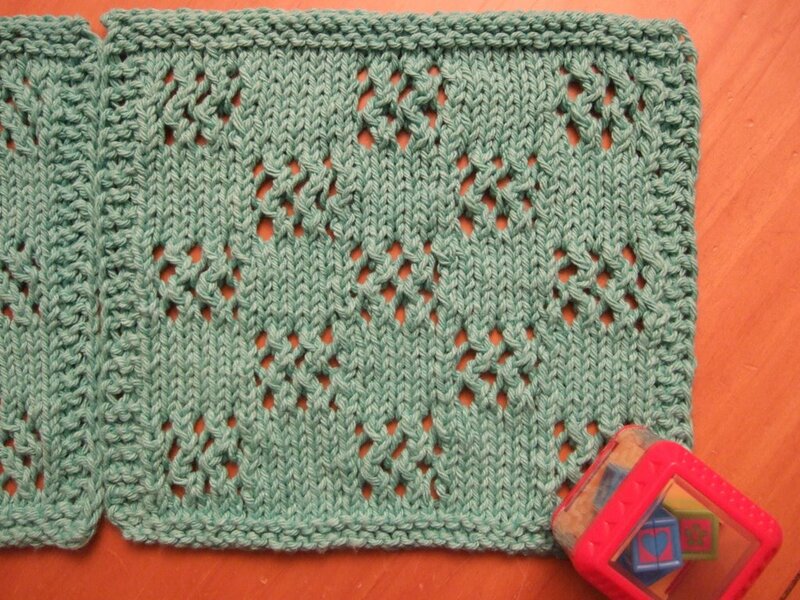 You just "read" the knitting and figure out what to do on the next round. I was aiming for some unisex design that a guy might even wear. What do you think? Is this unisex enough? It's a roll brim hat. Do guys wear roll brim hats? 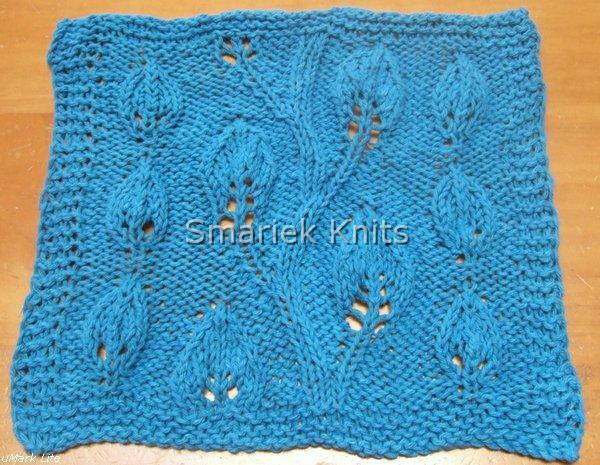 Maybe I should have made it K2P2 ribbing instead... should I continue with this pattern? Or should I start over? The Claudia Hat is named after a strong woman who survived breast cancer twice(! ), among other health issues. She is a wonderful example of how one can dodge the curve balls that Life throws at us. 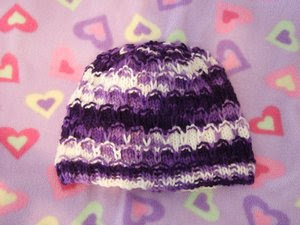 This is another hat that going to the Cap Karma Project this year. We are knitting chemo caps for local hospitals. It was fun when we did it last year. 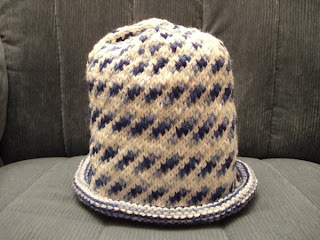 Check out the blog, there are some pictures of caps we made last year (check the earlist posts from October). 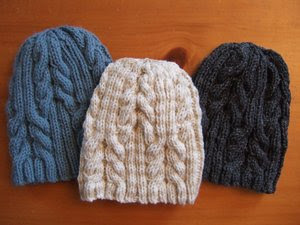 You'll be disappointed if you're looking for a hat knitted in the round. 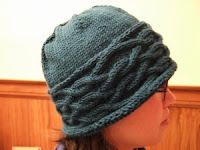 This Claudia Hat is knitted flat and then seamed at the end. 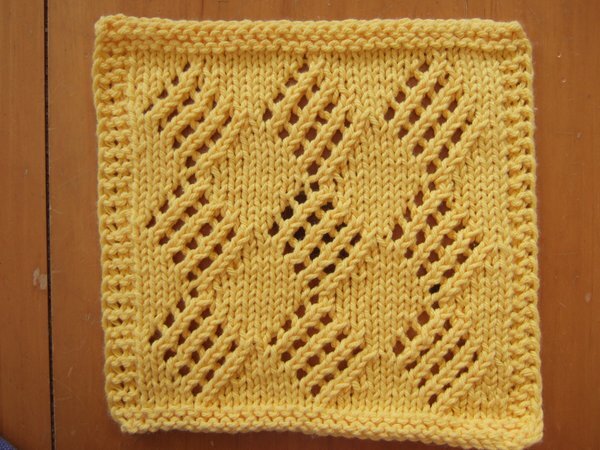 I tried to knit this in the round but I just couldn't manage it. I'm just not experienced enough for this one. This is my very first hat knitted flatly. 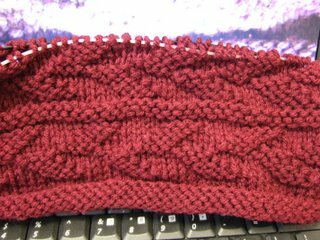 I have to say that it is more challenging to knit flat than to knit in the round. 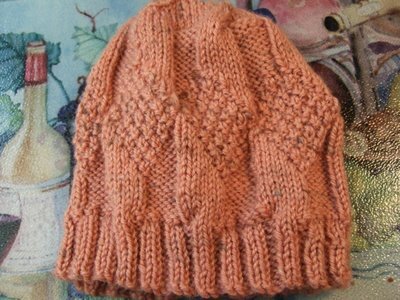 I could not get a good feel for how the hat was turning out as I knit it. And it just feels weird to knit a hat flat. The picture above shows a side view of the hat, which looks a lot like the front view, lol. 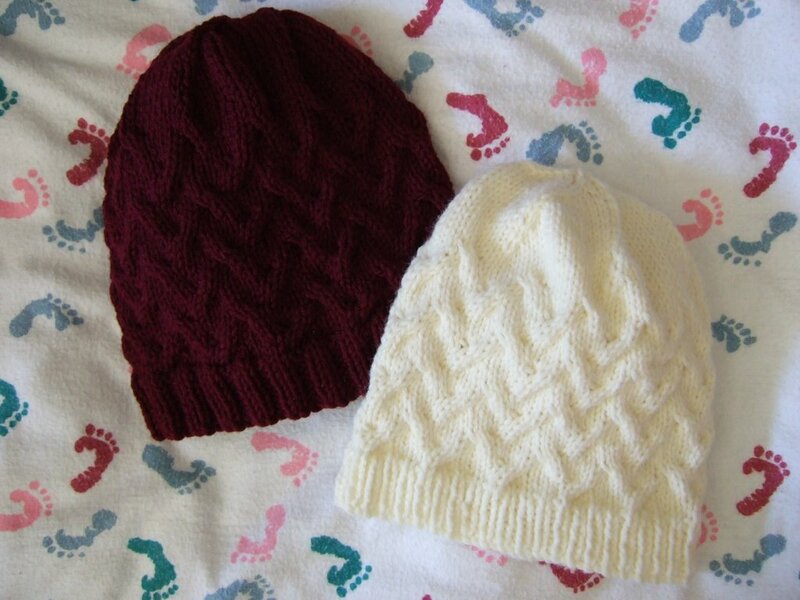 If you're looking for hats knitted in the round, try my 3AM Cable Hat, Asherton hat for toddler or adult, or Cap Karma Hat. 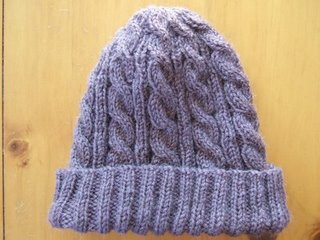 I was originally not going to share the pattern for this hat because I wasn't very happy with the way it turned out and didn't think I would knit it again, unless I sat down and worked out how to knit it in the round. I guess I really hate seaming. 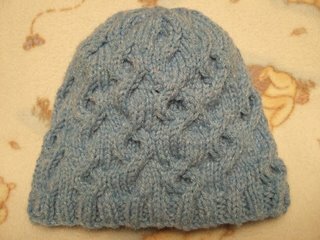 This was the first hat I've ever had to seam, and I have to say I much prefer knitting in the round. 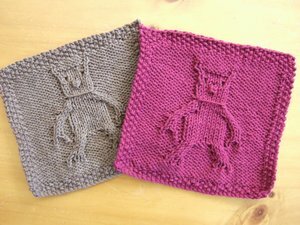 However I changed my mind, in case there is one person out there who might be interested in knitting one. And having the pattern here will make it that much easier for me when I'm ready to come back to it and try to convert it for round knitting. 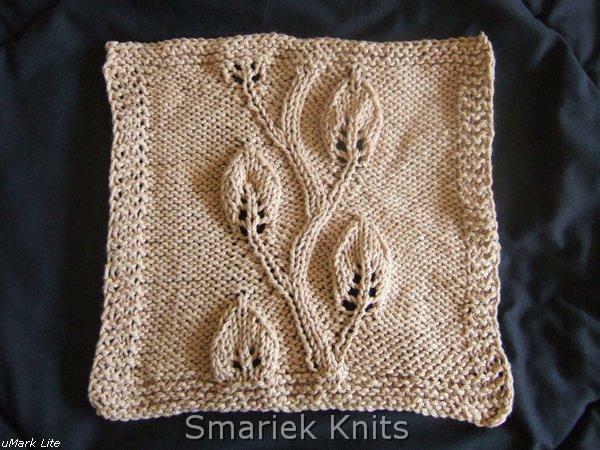 Using Worsted Weight yarn & US8 (5mm) needles, cast on 94 stitches. Cut yarn, thread through remaining stitches. Sew seam. Weave ends. Everything between asterisks are repeated throughout the round. So * P2, K2 * just means you P2, K2 across the entire row. x2, x3, and x4 after parentheses mean you do what is in the parentheses 2, 3, or 4 times. 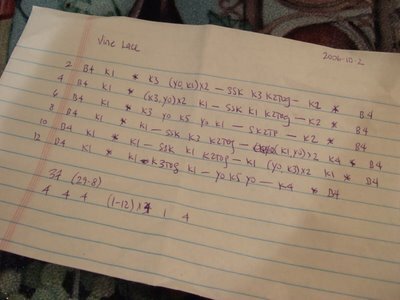 For example, (K1, P1) x2 means you do K1, P1 twice, viz. K1, P1, K1, P1. RT = Skip the next stitch. 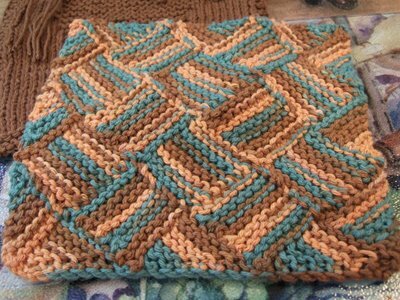 Knit the 2nd stitch. 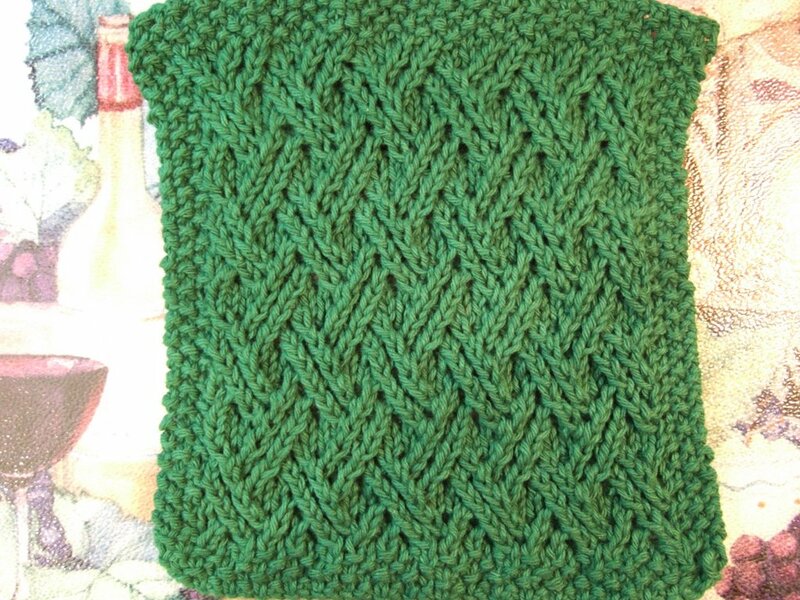 Then knit the skipped stitch. LT = Skip the next stitch. 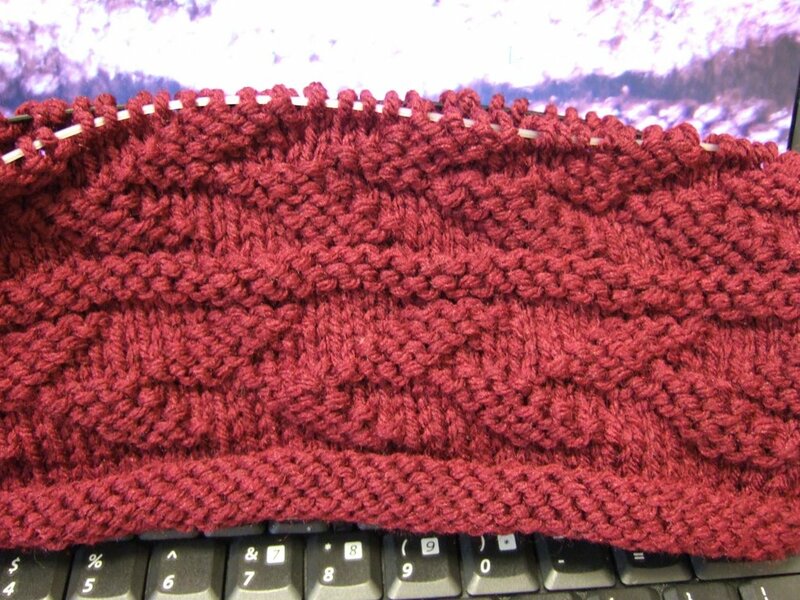 Knit the 2nd stitch in the back loop. 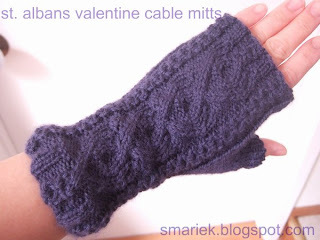 Then knit the skipped stitch. 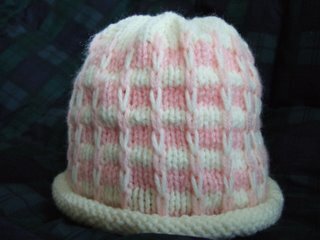 I'm a very inexperienced knitter, especially when it comes to knitting hats flat which require seaming at the end. Here's something you might want to try with this hat. Cast on 2 extra stitches to create a selvage that will make seaming easier; add a knit at the beginning and end of each row (actually, that would be knit on the right side, purl on the wrong side). And I feel I must mention this again. 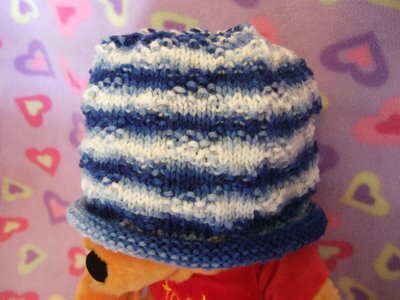 I am really not very happy with how this hat turned out. 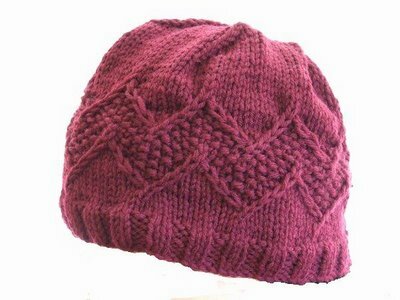 Perhaps it is a bad design, perhaps it is just my lack of experience with hats knitted flat, perhaps it is my lack of experience with seaming, or a combination of all three. 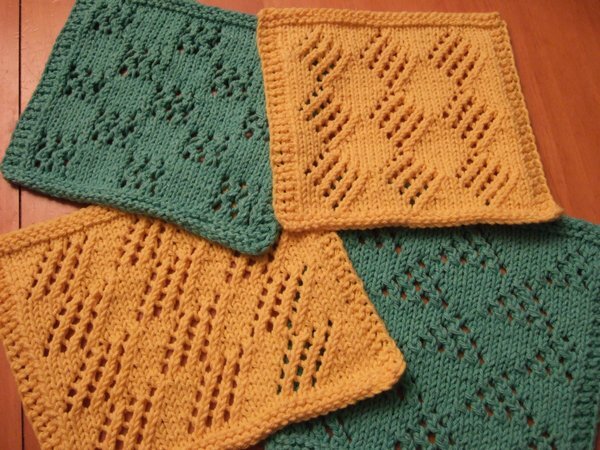 I hope you end up with better results if you decide to give this pattern a try. Good luck! 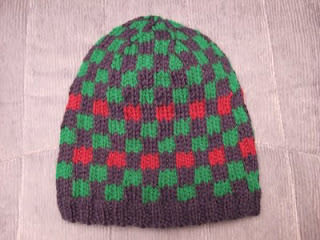 Here's my second Cap Karma Hat which actually follows the pattern I wrote. ;-) This hat is for the Cap Karma chemo hat project. Yes, we're back to Pooh Bear modelling the hats. I have another Disney bear, an orange one called Ojo (according to the label), no idea where he's from. Anyone know? 1. Designing the Claudia Hat (named after a strong woman who survived breast cancer twice(! ), among other health issues). 2. 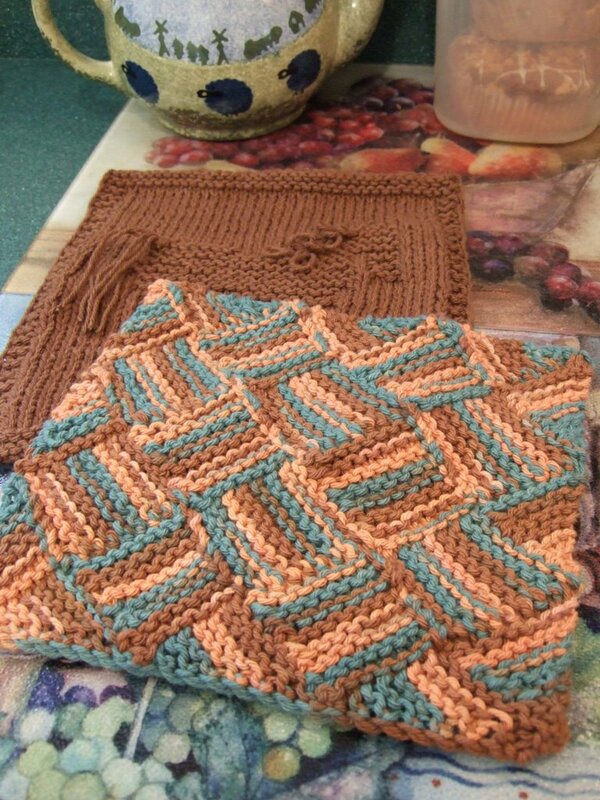 Designing a cloth for the Monthly Dishcloth KAL Q4 Exchange. Hope my exchange partner will like it. 3. Trying to finish up some knitting for family. This is where I'm making least progress. 4. 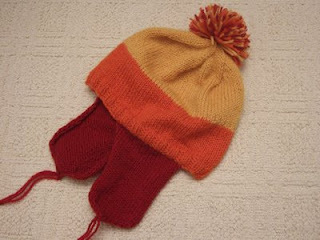 Looking into making Tom Baker's Doctor Who scarf for a friend. There are so many variations that it is mind-boggling trying to figure out which pattern to use (viz. color & row sequence). Here's a simple design with lacy diamonds. 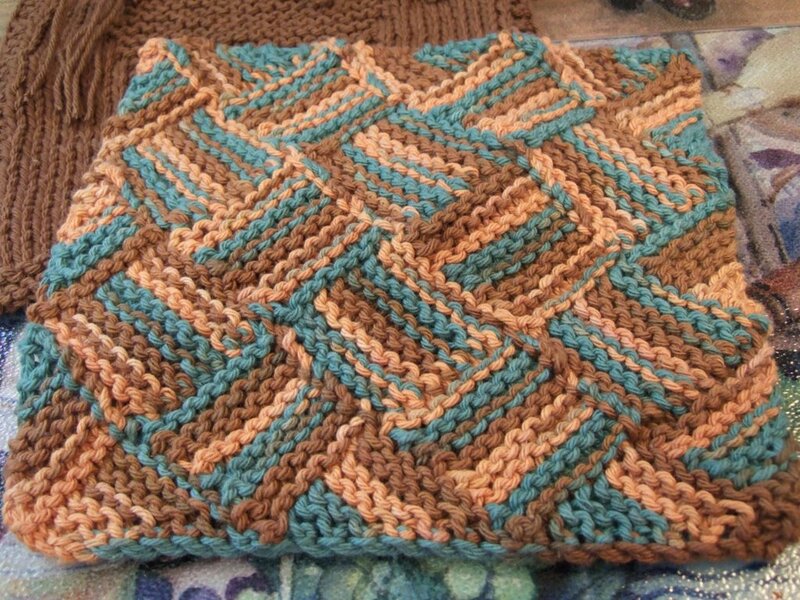 Sometimes I think the simpler patterns look better than more elaborate patterns. 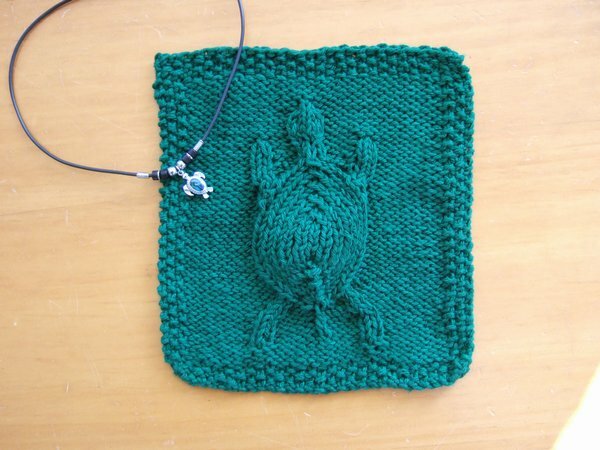 This one is pretty easy to knit up. 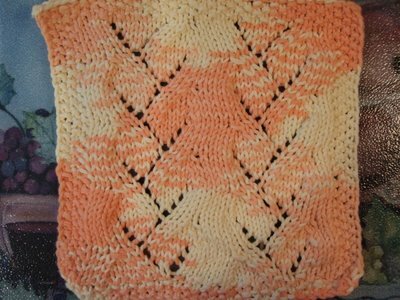 Both pictures show the cloth unblocked. It definitely looks better after a bit of blocking. Unfortunately the pics I took after blocking were all out of focus; guess I was just having a bad camera day. 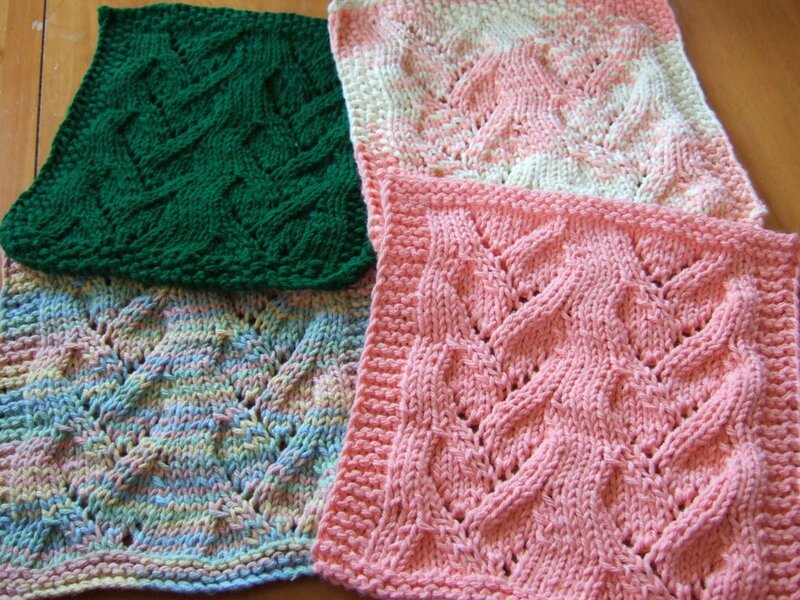 Using Worsted Weight yarn, and US7 (4.5mm) needles, cast on 39 stitches. Work 5 rows of seed stitch border. Repeat Rows 1 to 12 three more times. 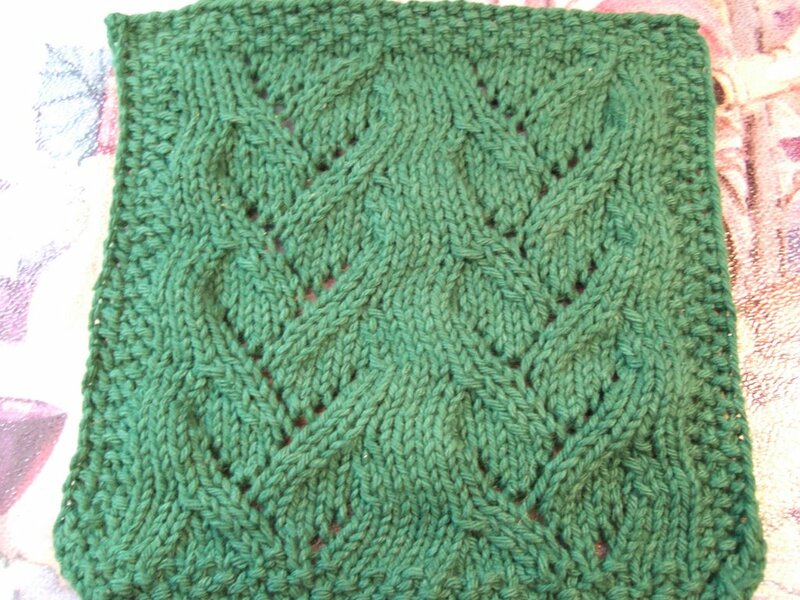 Knit 4 rows of seed stitch border. 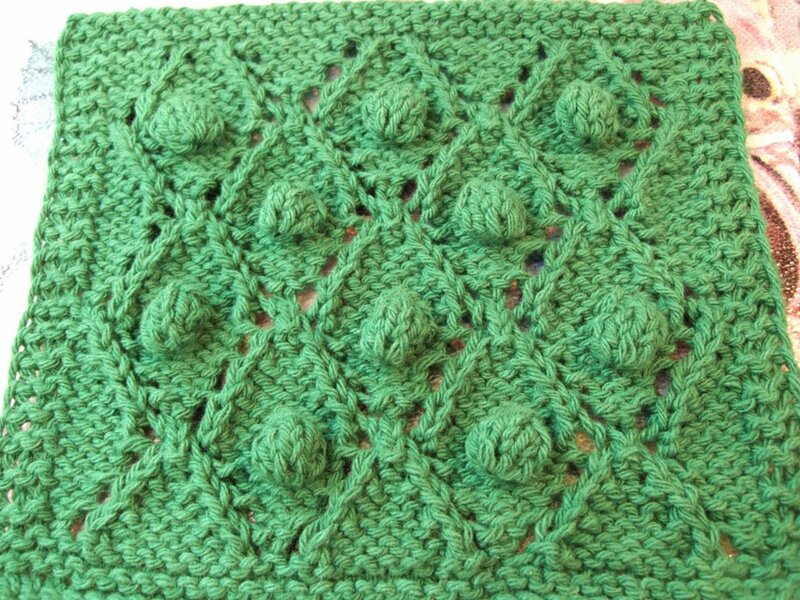 Seed stitch top & bottom rows = (K1, P1) across to penultimate stitch, end last stitch K1. Or you can use whatever border rows you prefer. 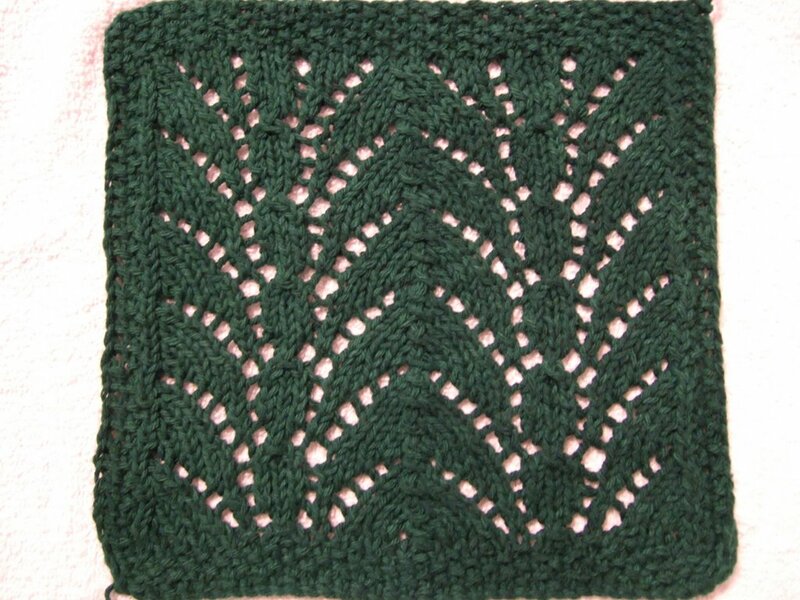 B4 = 4 stitch seed stitch border. K1, P1, K1, P1 at beginning of row. P1, K1, P1, K1 at end of row. 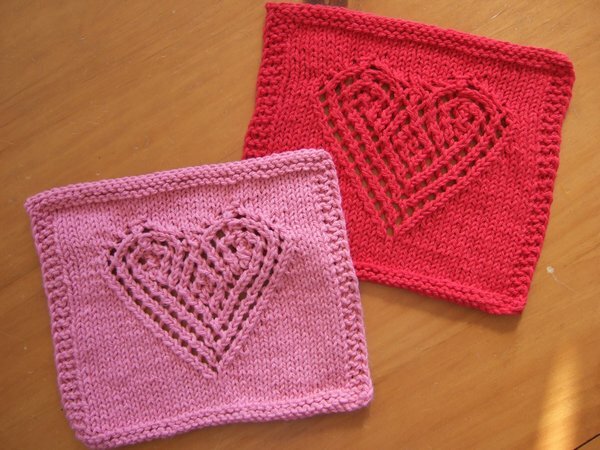 Or use whatever border stitch you prefer. Neato! I just discovered that somebody knitted my 3AM Cable Hat. It's neat to see what other people's versions look like. You can see Holly's hat on her blog, One More Row. 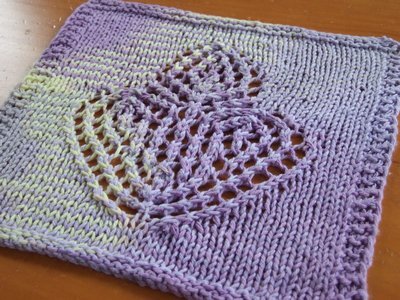 The colorway of her yarn is gorgeous! 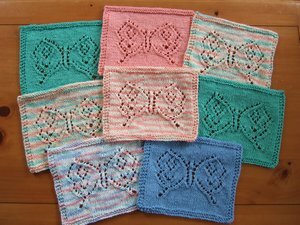 Sometimes I post these patterns and wonder if anybody is really interested. 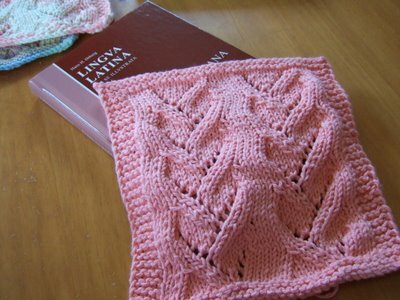 I post them so I know where I can go when I want to do the pattern again. 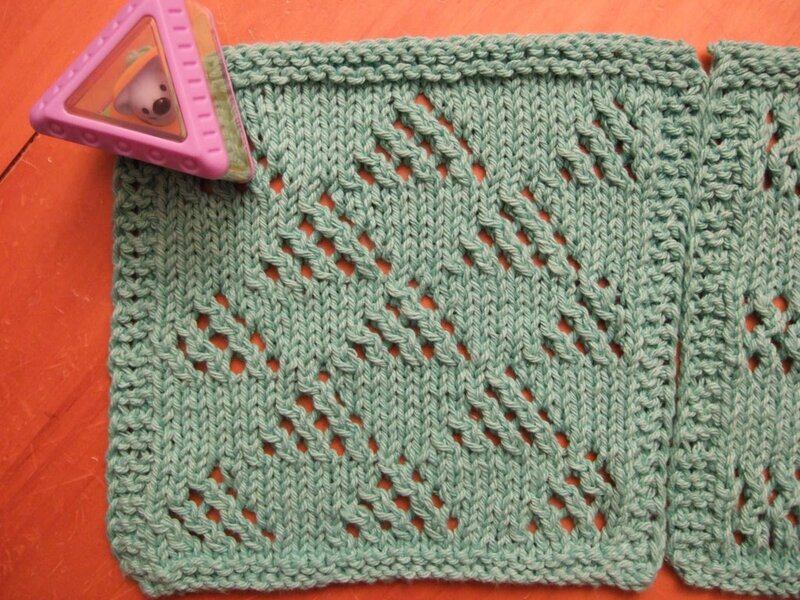 :-) It's so hard to knit with a toddler around and I feel like I get very little of it done, so posting my completed items makes me feel like I've actually gotten something done. 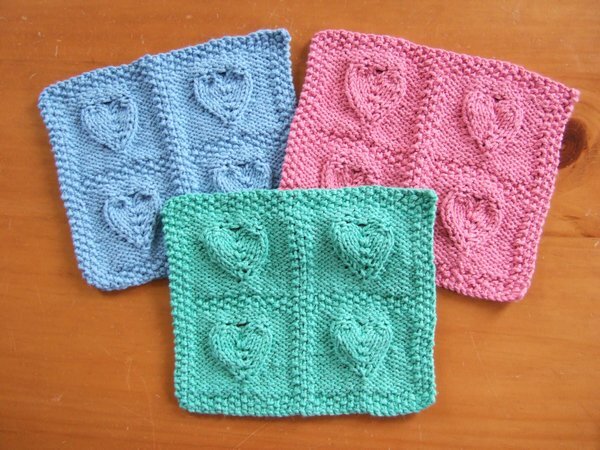 Here's a cool knitting cartoon on Franklin Habit's blog, The Panopticon, posted today. Check it out! 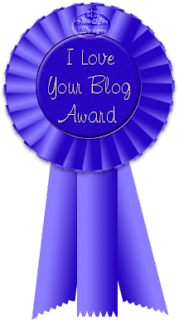 There's quite a learning curve to using Blogger. 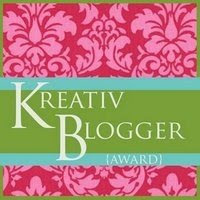 My blog is still a work in progess and I am still trying to figure some things out. It can be frustrating and time consuming, however I must say I make more progress tweaking my Blogger template than tweaking photos in Photoshop! Anyways, here are some things I would like to do but can't figure out how. I would appreciate any help in these areas. I saw a blog with an "expanding" Archive section. Instead of having an enumeration by Month/Year, it had arrows to the left where you can click on it to expand further. It was kinda like in Windows Explorer where you would click on the "+" sign to expand a folder to see what files and folders were beneath that. So the blog with the expanding Archive section was set up so you could click on the arrow next to the year, which would expand and show you an enumeration of months. There were arrows next to each month so you could click on them to expand and show you the posts made during that month. Neato mosquito, huh? Well, I haven't been able to figure out how to do this. The Blogger Help section was far from efficacious. I would really like to get this feature to work on my blog as my Archives section is getting a bit long. For the same reason, I would also like something similar for my links. 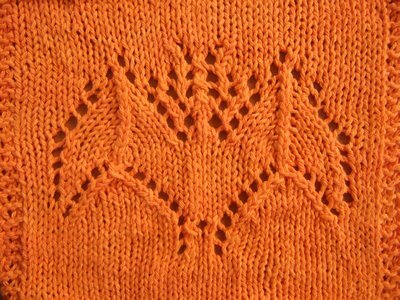 My enumeration Knitting Blogs is getting long, and I haven't even added all the ones I want to add. 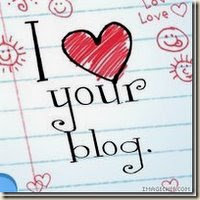 I saw on some other people's blogs a "click here to see the blogs I read" type link which will expand to show a list of blog links. How do I implement this? For some reason I thought Blogroll would do that, but I played with that briefly and couldn't figure out what I could do with Blogroll. I designed this Cap Karma Hat for the Cap Karma chemo hat project, where a bunch of people knit or crochet chemo hats to donate to local Bay Area hospitals. 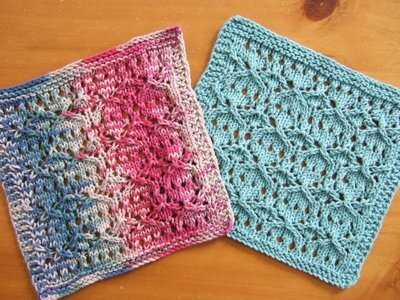 I made this an easy designs since V thinks I tend to choose patterns that aren't so easy. I can do this hat blindfolded, just like the Asherton Hat. I tried to get Stitch (from Lilo & Stitch, great movie!) 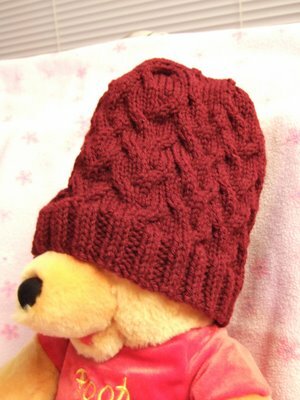 to model the hat since you guys are probably sick of seeing Pooh bear, but he turned out to be not such a good hat model. He sits still very well, however (as you can see from the photo below) the hat covers his entire face! Poor Stitch, doesn't he look like he's being tortured or something? 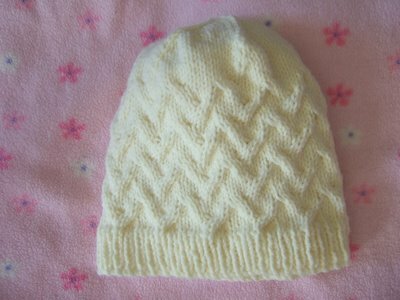 This cream colored hat has K1P1 ribbing and was knit a smidgen smaller than the pattern version for a snug fit (ladies xs size). The pattern hat is designed as a Ladies Small size. http://smariek.blogspot.com/2006/10/cap-karma-hat-2.html. 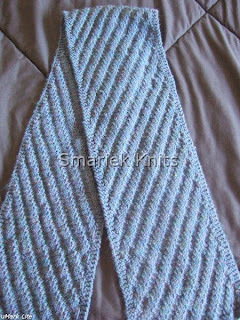 This one actually follows the pattern using K2P2 ribbing. 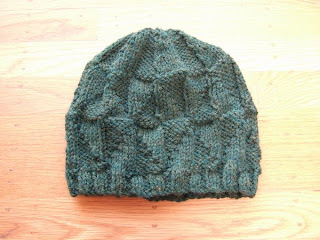 Brooklyn Tweed has tweaked the decrease so that the cables continue up to the top, you'll find the instructions for this here: http://brooklyntweed.blogspot.com/2007/10/cap-karma.html. 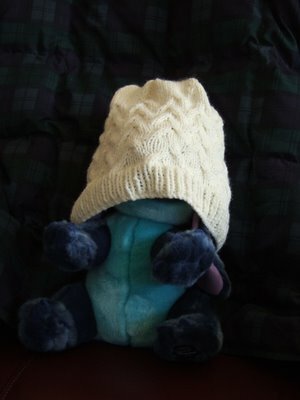 It certainly shows how lazy I was when I originally designed this hat, lol. 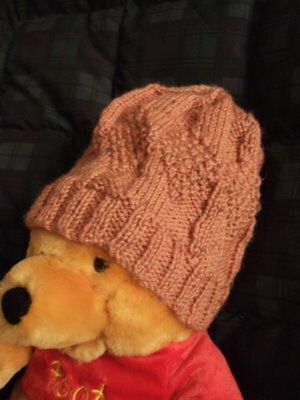 His version really does look better and you can see numerous examples of it from other people who have knit this hat, on Ravelry. The Buttercream cloth has a garter stitch border. 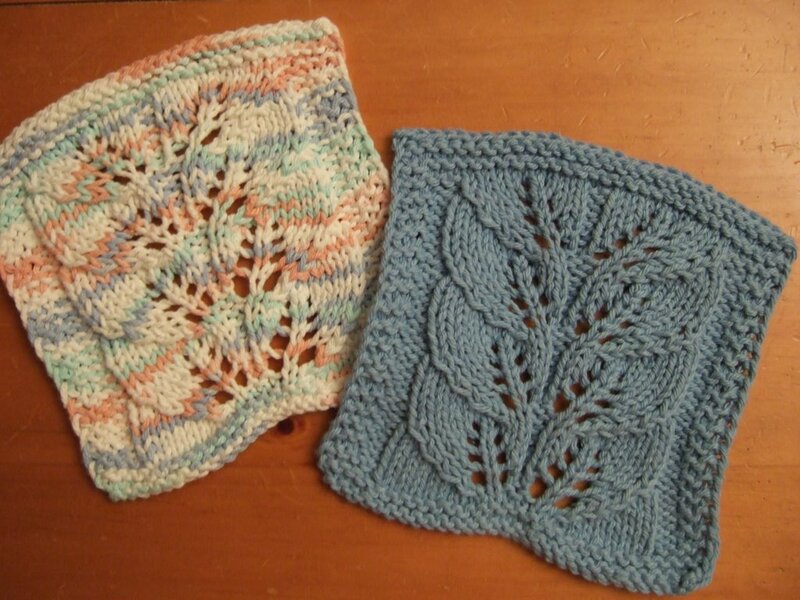 I haven't decided which border I prefer. I like them both! 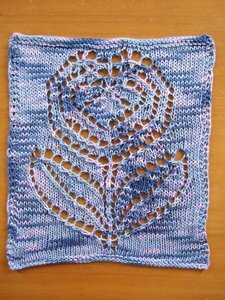 This one is the Tea Rose cloth. I really love this color! I was trying to see whether it was a close enough color to the rose section of the Lingua Latina book. It's not really a good color match. 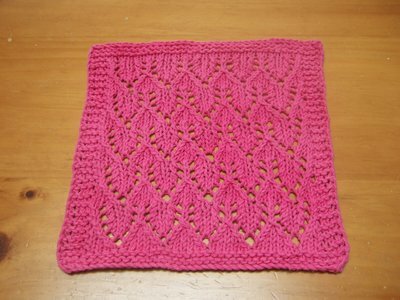 But I do like how this picture shows off the pattern. My head on shots of the cloth didn't look as good. This one in Dark Pine (I think that is what it was called?) 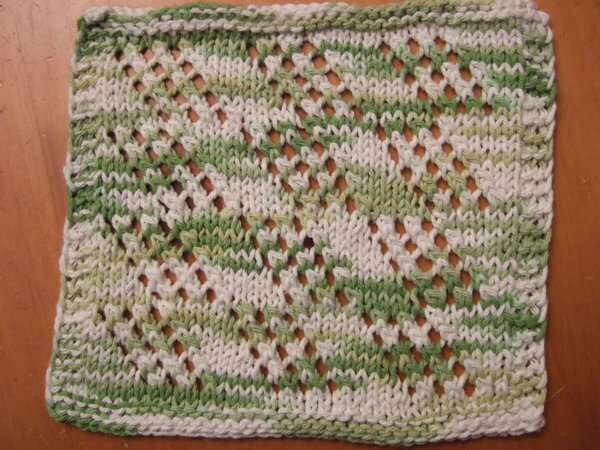 has a seed stitch border. 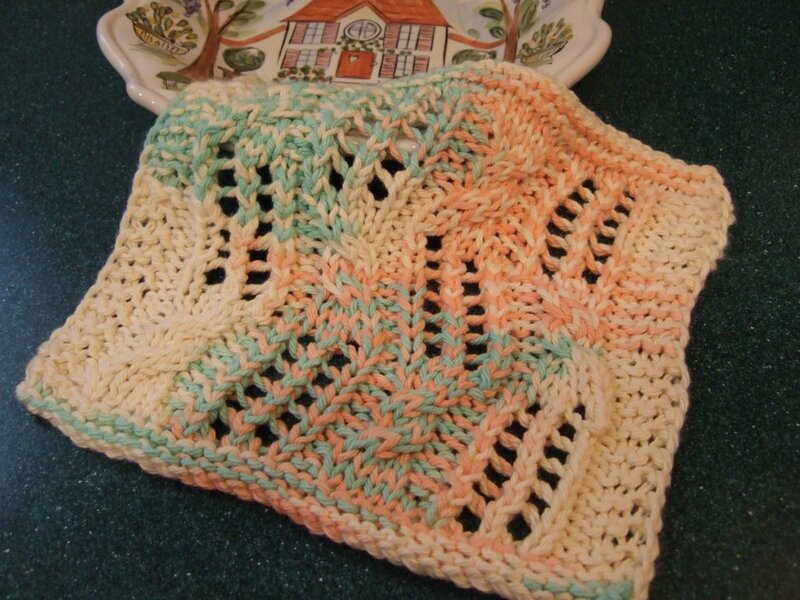 This Orange Sherbet cloth has a seed stitch border. There's actually a bit of a boo boo in this cloth. :-( That's what happens when I'm knitting in dim lighting. 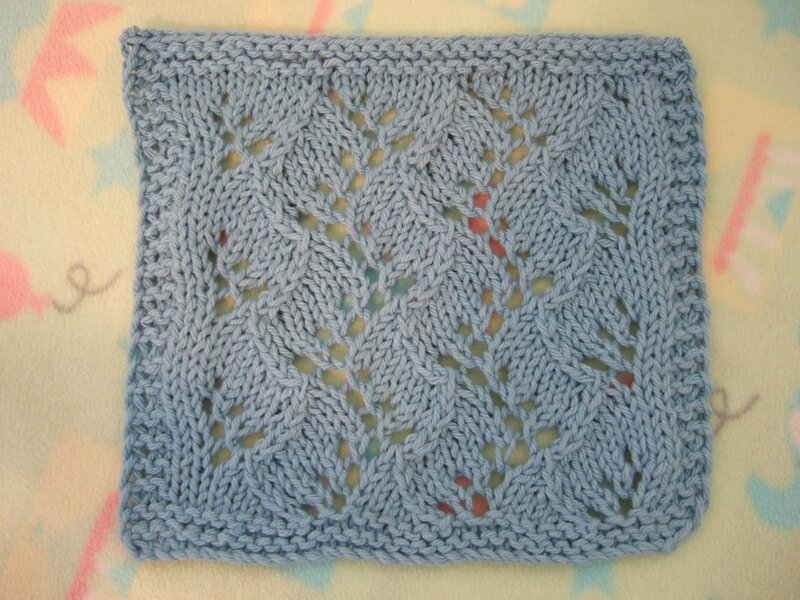 Using WW cotton yarn, and US7 (4.5mm) needles, cast on 37 stitches. Repeat Rows 1 through 12 three more times (for a total of 4 repeats). Instructions in parentheses followed by x2 mean you do what is in the paretheses twice. For example, (YO, K1)x2 means YO, K1, YO, K1. 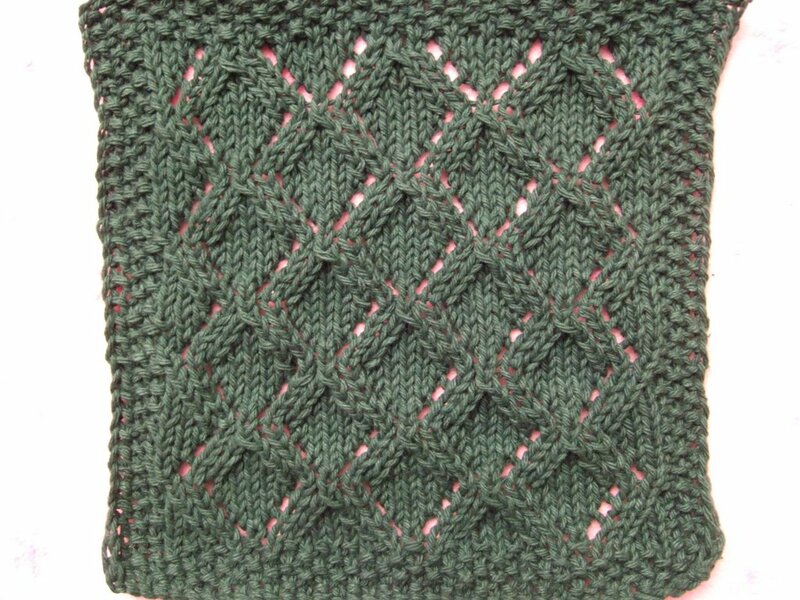 Everything between asterisks (* ... *) are repeated once more before you do the 4 border stitches at the end of the row. I usually do my knitting on the go, in the car while my little girl is napping. 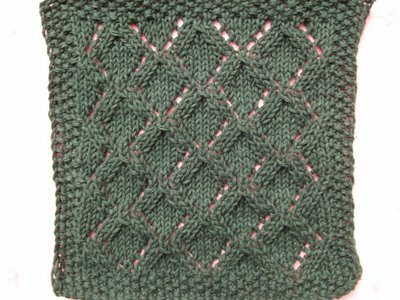 Here's a picture of the pattern I carried around with me, it got tossed into the little Bumble & Bumble bag along with my yarn & needles. It's the perfect size bag for my dishcloths, and the plastic handles stick up (not like "rope" that droops down), so it's easy to pick up. It goes between house & car. I also like this bag because it doesn't make loud crinkly noises as much as the little Bath & Body Works bag I use for my other car project; that one stays in the car. 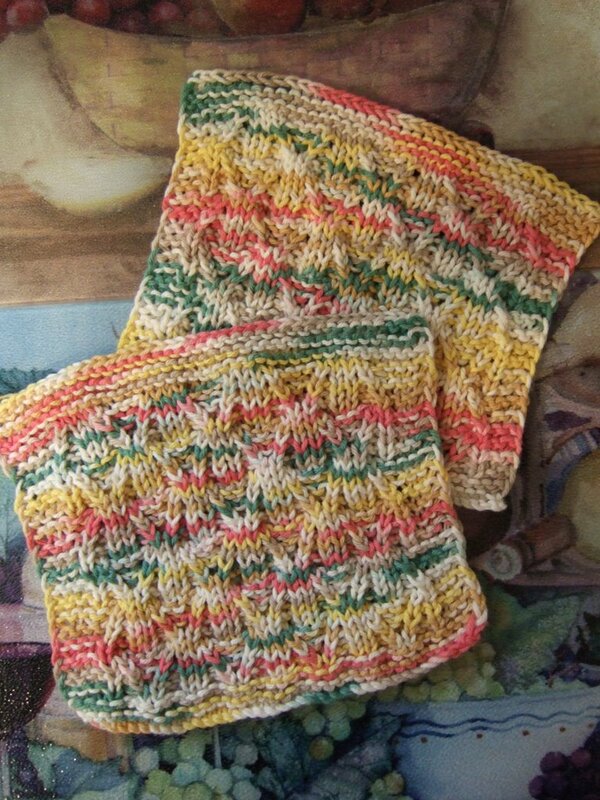 I was thinking of participating in the 4th quarter Monthly Dishcloth KAL exchange which starts later this month. I haven't decided. 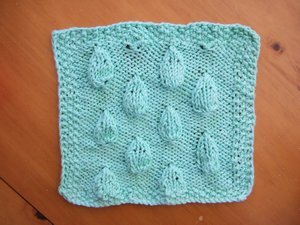 I would like to create a pattern for this, yet I'm not sure whether I will have time to do that and finish the cloth in time for mailing. Plus there's the question of making it to the post office, which would normally not be a problem except if it happens to rain for several weeks during the mailing period for this exchange, as it would be impossible to go out with my baby girl in the rain. So I hesitate to commit to the exchange if I'm not 100% sure I can follow through with it. Well, it took me nearly a month to finish the toddler size version of my Asherton Hat because I used DK weight yarn (thinking smaller person, lighter/thinner yarn should work better, right?) and lighter weight yarn means knitting forever and getting little mileage. 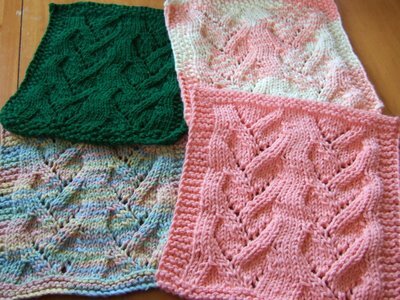 Plus, I'm a slow knitter with limited time for knitting (having a toddler around pulling on my yarn & needles doesn't help). 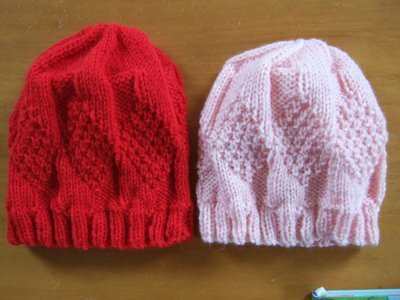 This hat is similar to the red adult size Asherton Hat (pattern found on this page), and the slightly smaller pink adult size Asherton Hat (this page shows better pictures). These hats are based on the Asherton Scarf. 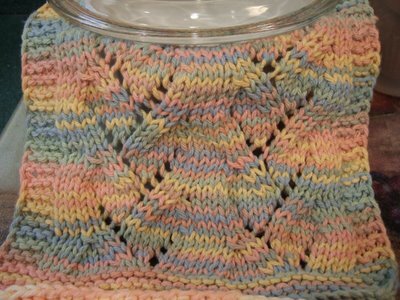 The yarn is Cleckheaton Country 8-Ply DK superwash wool, don't remember the name of the color. Maybe dusty rose/pink, the label says color 1831. The hat fits my 18 month girl with room to grow into. She already knows how to put the hat on herself, which makes life a lot simpler for me when she accidentaly drops her hat while riding in the Ergo Baby Carrier. Babies come in all shapes & sizes. M is on the petite side (she's in the lower percentile on the growth chart), so I'm pretty sure this hat would definitely fit a younger baby who happens to be larger. I finally decided to give the Garterlac a try. I think it looks wonderful, but it is tedious to knit with all the turning back and forth, plus tedious if you're like me who has to pick up & put down at a drop of a hat. It got confusing when picking it back up, trying to untangle the yarn, and trying to figure out which direction I'm supposed to continue knitting in. 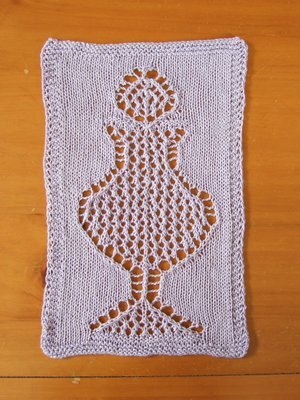 This cloth would be easier to knit if I just had a long dedicated time slot for concentrating on it. 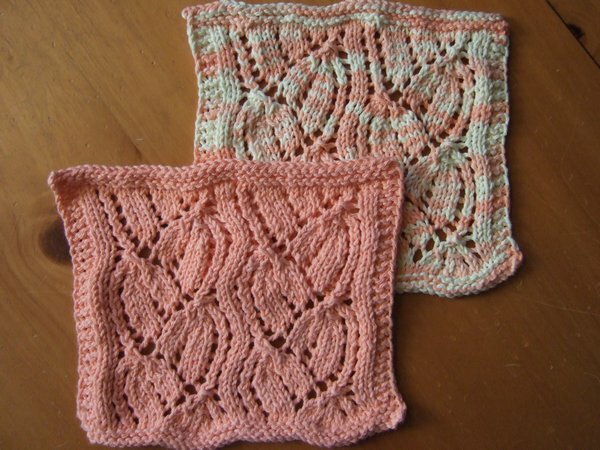 However I must say that the Garterlac pattern is well written and easy to follow. The picture above was taken with the Horse Cloth which I am going to give to my father-in-law (because his Chinese Zodiac sign is the horse). 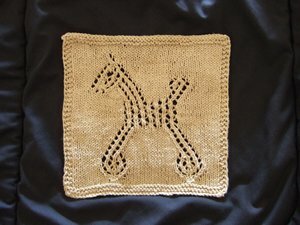 I thought that this Garterlac done in Country Brown ombre (I think that's what it's called) would "go" well with the brown horse cloth. The picture below shows a closeup.